Handed a crumpled paper by a nervous boy with eyes the color of reeds, you find yourself reading an invitation to visit a marketplace - Malveria's Bazaar of the Rare and Unknowable. The paper promises sights and wonders from around the worlds for those who make their way to the craftsmen's quarter of town, and is ornamented with a portrait of a beautiful dark-haired woman. As you round the familiar corners of town, Malveria's Bazaar comes into view, shrouded in voluminous colored smoke and the whining drone of indistinct music. Stalls line the avenue of a city block that feels all at once alien and familiar, populated by bizarre shoppers. Their teeming shuffle makes you aware that you are instantly in the busiest place you've ever been, with barking food cart chefs hawking their delicacies both strange and commonplace. Smoky haze floats over the landscape, obscuring details in a heady cloud of intoxicating scents and mystery. Each of the customers you see seems more foreign, more out of place, than the last. A stoic elf princess and her retinue of attendants passes through the crowded stalls and into the colored smoke, disappearing as though she never was. A ghoul lifts a prospective purchase with his good arm, this being the one with the most fingers still attached, to inspect the treasure with a milky eye. A cyclopean man - or woman? It's impossible to be sure - bedecked in ruddy orange woven fabrics and smelling of fermented mud and drowning in gold bands and loops chatters in incomprehensible hisses to a remarkably fluent trader behind a stall counter. In the corner of your eye you notice Malveria herself emerge from billowing haze, holding court amongst the gathered shoppers like something of a celebrity. She hangs on the edge of your imagination, her features just slightly different, slightly wrong, for a human woman; as though something else inhabited its closest approximation of a traveling purveyor of rare goods. She lives, breathes, and moves about the jovial atmosphere in ways just different from your own to make you watch closely. Her dark skin, her curly, wispy hair all perfect, but somehow wrong, as though she were merely a reflection of a woman in a mirror that's not quite smooth. She glances at you and flashes a brief grin, and though you make eye contact, it feels as though the smile was aimed at someone else, intended for someone you can't see. For all you know she is merely a merchant, same as any other, made mysterious and interesting by the deeply-perfumed smoke and ambiance. Try and shake it all you want, but something about her captivating but sinister charisma, her imperceptibly and indescribably incorrect motions, her disarming laugh and crooning voice makes you believe she must be something else. She moves through the crowd and is gone from sight almost as fast as she appeared. Around you, tables lay festooned with goods. Close inspection reveals they all seem to be selling articles of elvish make. Smooth, gracefully-shaped dolls, each nearly half the height of a halfling, made of an ultra lightweight balsa-type wood. Each doll has nearly six feet of luxurious flaxen hair trailing behind it, kept bundled up in silken bags tied to each doll for safekeeping. Said to be educational items for young elven maids to learn different hairstyling techniques over their first fifty years of childhood. Racks of elvish glassware jewelry, famed for its resplendent clarity and immaculate shape. Most feature wound silver wire mountings, but some are set in pale golds and even some rosy mithril. All of it is costly, but breathtaking. A comb carved elaborately from the ivory of a tusked ape, depicting the entwined forms of two lovers amidst a bed of flowers. Dragging this comb through your grungy, dungeon-matted hair once a day will clean hair completely and leave it soft and smelling strongly of lavender and linen. A glass marble on a piece of parchment labeling it as an "elven compass". Seems to have no function. Slices of bread, each wrapped in variegated leaves. Each slice is flavored by a different fruit, and fills a human tummy for a single day. An elf can eat one slice every three days for the same nourishment. Swimming within three hours of eating this bread is ill-advised, as the unfortunate diver will sink like a stone. A poncho woven from the threads of the huge silkgrubs that dangle in elven forests. It is colored with various green dyes to depict a pattern of trees in one shade ringing the bottom, followed by another shade shaped like mountains behind the trees, and lastly swirling waves of embroidered birds circling the open pale green sky. Two matching vars-estoril, which rougly translates in Low Elven to "pathfinder walking sticks", each topped with a hanging birdcage made of vines containing a chirping bird. The birds are bright yellow and flicker briefly each time they chirp. Encouraging them to sing lets them generate enough light to see by. Twisted vine headband akin to the laurels of a Roman ruler, conveying status and rank as an elven noble to the wearer. The vines live, and continue to twist and knot while worn, but do not seem to grow in length or breadth. Provides +2 to all reaction rolls with lowborn forest-dwelling elves. A tunic which is clearly made of bark and wood, but which has the pliability and suppleness of finely tanned leather. The edges are "gilt" with leaves ranging from a light honey color to a very dark russet and every shade of amber in between, presenting a lovely gradient from dark to light. Defense as chainmail, but does not compromise spellcasting or the natural equipment restrictions of druids. A set of windchimes which play perfect imitations of birdsongs when the wind hits them. The wildest cutlery you've ever seen in your life, described as the accoutrements of the highest echelons of formal elven fine dining. Twisted forks with one tine, a set of what are either chopsticks for grasping food or tweezers for peeling the tough shell off of delicate shrieking nuts, a spoon with one large hole in the center, a small dish shaped like an oversized thimble with no clear purpose, a wedge-shaped napkin and a circular napkin tucked together in the fluted handle of what seems to be a savagely serrated pie serving knife, and more. A seedling which, if planted in an open wound on a limb stump, will grow into a living wooden prosthetic in 1d8 days. The prosthetic will bud and flower seasonally. Various earth-smelling oils in fabulous glass jars which are said to clear the aura and align the centers of the soul. Cures most curses. Several feather quills constructed of the tail plumage of the giant scarlet sparrows that inhabit the northeastern woods of the elven kingdoms in the autumn. These pens write without ink and their words can produce convincing, brief illusions. Commonly used by elvish poets to insult and mock each other in the convoluted game of elven art critique, these pens are frequently employed to write scathing letters sent by poets and authors to one another which, when read, will create fanciful images in the air - a classic example being the sad shame of a poet described in such a letter as having a tremendous mouth and little brain behind it, who was aghast when the letter indeed created illusions on his face of a massive pair of lips blocking most of his visage from view for several minutes at the premiere of his latest play as he stood surrounded by nobility. A set of elven tombscrolls, which contain songs to be sung about the deeds of the dead during their life. Singing the complete set would take approximately sixteen straight hours. These are addressed to the late Raliaster Shalandril, and are still bound with a silk cord and wooden seal which is stamped with the location of the burial, indicating they have not been sung and the soul of the elf is not at rest. Ornate earrings of iridescent black material. They do not have hooks. They are trained beetles, which clamp onto the earlobes of the wearer with their fine pincers on command. Their glistening black shells have been inscribed in excruciatingly minute and complex scrollwork patterns and inlaid with the finest gold leaf. A platter of sandwiches containing delicately ruffled leafy greens, slivers of pickled green carrots, flayed squirrels seasoned with spices smelling of cinnamon and hot peppers, and an unidentifiable orange paste between two slices of wafer-thin crisp bread. A sign on the platter indicates they are free to customers only. A harp made from miraculously twisted vines so fine and numerous as to be innumerable. It stands nearly seven feet tall, features 127 razor-fine elfsteel strings because prime numbers produce the most exquisite music, and weighs almost 200lbs. The sounds it makes when played by an untrained humanoid are akin to the warbling of horrified sexually-dysfunctional cats. When played by a trained expert, its music is legendary and suitable for the most opulent and demanding of royalty. +10 max HP until next level up, then reroll all HD+1d4 and keep new total. 1d6 hrs: Makes voice high pitched, disorients echolocating creatures, -1 reaction from non-elf humanoids/+1 reaction from elves and fae. 1d4 hrs: Inspires musical talent; singing can function as Sleep spell of same character level once per hour. Learn a random language for 1d8 days, then take 1d4HP mental damage when you forget. A pair of bows which must be sold as a set. These comprise what is described as a "heart-linked" set of bows as would be carried by the famed professional archers of the ninth elven empire, which decimated the assembled armies of man many years ago. The first is an elvish warbow, a very long and flexible bow with an asymmetrical shape which is difficult (-1 to-hit at all ranges) for non-elves to use correctly. Elf characters using this bow take no such penalty, and gain +1 to damage and +40' to maximum range (and all AD&D range adjustments to AC, if used) over a standard longbow. The second is a composite shortbow of horn and wood harvested from the axe used to fell the tree that made the first bow. This connection, axe and tree, links the bows spiritually in the elven tradition. Your shopping done, you and your compatriots walk awkwardly away from the buzz and din of the marketplace like drunks leaving a tavern, stepping carefully through the smoke. Step by step, the world becomes more familiar. The city block you remember takes shape; it was always there, the buildings the same as they always were, the cobblestones just as worn by wagon wheels as before - but by the time you realize the night air is still and clear and silent once more, and turn around to see what you've left behind, it is gone. The whole bazaar, as if it had never been there. On the wind, a sheet of thin paper flutters just out of reach - inked with a festive entreaty to visit Malveria's Bazaar of the Rare and Unknowable. 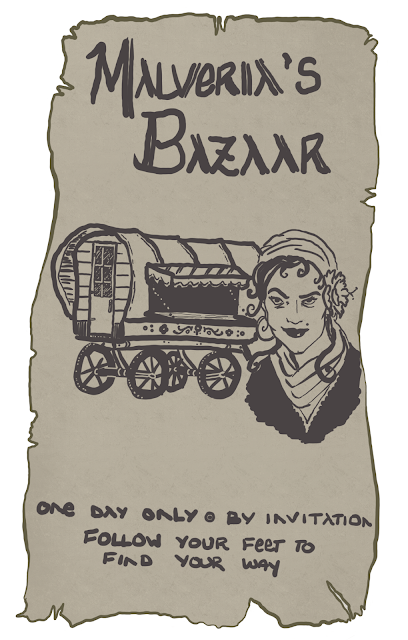 Malveria's Bazaar is to be a recurring feature for this blog. I'll post more articles about its marvelous goods from time to time. It is an extradimensional marketplace that arrives and leaves at the whim of the eponymous Malveria, and may never have really been there in the first place. It may spontaneously overtake a city block in the stillness of night with raucous business and somehow go without mention the next day, or it might capture the attention of an entire village when it appears outside the walls in caravans - as though Malveria decides which it will be. It seems that its customers arrive from everywhere and leave to nowhere; it is impossible to follow others out of the marketplace as they exit between walls of smoke or turn a corner and disappear. It is all at once out of place and right at home, and defies reason. I did not include costs in this because it is completely impossible to judge the relative value of these trinkets in your world. The are curios, they are relics, they are rarities. Sometimes they're all three. Your setting may find elven items widely traded, so if I priced them according to mine they'd be hugely inflated in your game. Try to use your own judgment, and don't be afraid to have Malveria's merchants accept payment in things other than gold and gems -- a hit point, permanently, perhaps, for this rare bow; a page from a spellbook in exchange for a scroll. Make it interesting if you like! Additionally, this article represents a first for the blog: it comes with several contributions from the imaginations of my wife, and several from my good friends who are best described as a swamp man and his lovely, patient handler. That's not even a joke; two of my friends contributed to this article and those are the best anonymized ways to describe them, bless their hearts. If you have anything you'd like to add, ask, or say, hit me up on Twitter @dungeonspossums or here in the comments and I'll be sure the appropriate people are notified.